a. They cover a pulse point, so they help keep you warm. b. They look good peeking out from your jacket cuffs. c. They only take a small amount of yarn. Therefore they make a economical and practical gift. Think stocking stuffer or office gift exchange. These are my versions of this utilitarian little accessory. Two ruffles to peek out of your jacket cuff. Foundation: Chain 22 [26. 30] join with slipstitch in first chain. RE-Round 1: Attach yarn with a sc in any unused loop of beginning chain. Sc in each chain around. Join with a slipstitch in the back loop of beginning sc. RE-Round 2: Working in the back loop only for this round. Ch 5, *tr, ch 1, tr, ch 1, in same stitch. *Tr, ch 1, tr, ch 1, tr, ch 1 in next stitch. Repeat from * around. Join with a slipstitch in 4th chain of ch 5. Ch 1, slip stitch in chains 3, 2, and 1 of beginning chain 5. Slipstitch in front loop of first sc of round 1. RE-Round 3: Working in the front loop only for this round. Ch 4, *dc, ch 1, dc, ch 1, in same stitch. *Dc, ch 1, dc, ch 1, dc, ch 1 in next stitch. Repeat from * around. Join with a slipstitch in 3rd chain of ch 4. This version has only one ruffle. Foundation: Chain 22 [26. 30], join with slipstitch in first chain. RE-Round 1: Attach yarn with a sc in any unused loop of beginning chain. Ch 1, sc in same stitch and each chain around. Join with a slipstitch in the beginning sc. RE-Round 2: Ch 5, *tr, ch 1, tr, ch 1, in same stitch. *Tr, ch 1, tr, ch 1, tr, ch 1 in next stitch. Repeat from * around. Join with a slipstitch in 4th chain of ch 5. This version has no ruffle, suitable for boys or men. These would be awesome done in the same colors as the Chevron Ear Warmers. The bear is cute also the wrislets and wristers too. 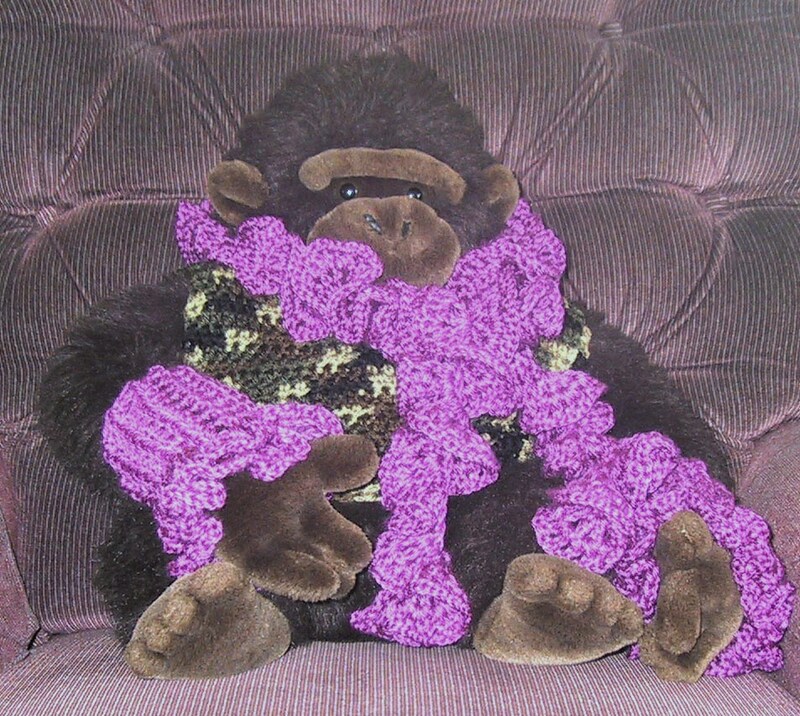 I love this but where can I find the pattern of the scarf to match the wrislets?